The cost of additional pulsation dampeners, along with ongoing costs of charging and maintenance is avoided in many instances and systems become more reliable. Pulsation is usually observed as noisy vibration in system components or rapid gauge fluctuation, this vibration can be a major problem. 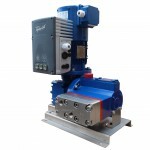 The Hydra-Cell pump range can accommodate measured flow requirements from 1 to 6360 litres per hour at pressures of up to 172 bar with virtually no pulsation.